How about another EQ design challenge? This one features a beautiful batik collection called Twilight Chic from Island Batik. Design a quilt in EQ using fabrics from Deb Tucker’s Studio 180 Design Twilight Chic Collection, a signature collection designed by Kathy Engle from Island Batik. 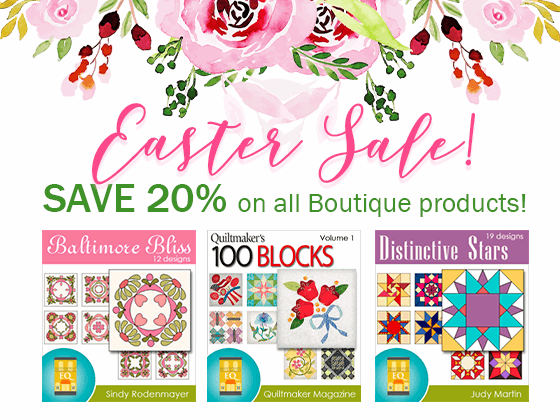 You could win some fabulous Island Batik precuts! Your EQ quilt must use fabrics from the Twilight Chic collection. If desired, you may use up to 3 other fabrics from the Island Batik collections in the Manufacturer Basics section of the EQ8 Fabric Library (Basics, Blenders, and Neutrals). Quilt must be submitted by March 31. Two random winners will receive a Twilight Chic Stack (10” squares) and a Twilight Chic Strip (2.5” strips) Precuts! Winners will be announced April 3 on the blog. To celebrate Deb Tucker’s first Island Batik Signature Fabric Collection, Deb is offering the opportunity to win a bonus prize. To be eligible to win the bonus prize, your winning quilt design would use a Studio 180 Design Tool(s) to make the quilt. Identify on your entry in the comments section which of the Studio 180 tools would be used for which units in your design. The additional prize is a $30 gift certificate to be used on Deb Tucker’s Studio 180 Design website: www.Studio180Design.net. Entries are welcomed from all. Prizes will only be shipped to the continental U.S.
Good luck to all participants! We can’t wait to see your entries! In the comment form below, tell us a little bit about your design. If you designed with Studio 180 Tool(s) in mind, let us know which tool(s) you would use for which units of your quilt, to be eligible to win the bonus prize. Then click Browse to include the image of your quilt. Cut 2 – 6” WOF strips (1/2 yard purple) , sub-cut into 10 – 6” squares. Make 80 – 2” finished Half Square Triangles (HST) using Studio 180 Design “Eight at Time” Technique Sheet & Tucker Trimmer I tool. Jelly Roll – 20 WOF strips cut one 8.5” x 2 ½” & one 10.5” x 2 ½” rectangles. Cut 2 – 6” WOF strips, sub-cut into 10 – 6” squares for 80 – 2” finished Half Square Triangles (HST) using Studio 180 Design “Eight at Time” Technique Sheet & Tucker Trimmer I tool. 20 – 2 ½” squares for bear paw corner from 2 – 2 ½” WOF strips. 20 – 3 ¼” squares cut once diagonally from 2 – 3 ¼” WOF strips for replacement triangles using Studio 180 Design Corner Pop tool. Cut 4 – 10 ½” WOF strips, sub-cut into 16 – 10 ½” squares. Very nice to share the instructions! Thank you. Thanks for sharing your pattern with instructions! These batiks are beautiful and I immediately thought of creating some sort of “kaleidescope” quilt. Love the movement in the design. Love the fabrics but wish there was a bit more contrast for my log cabin. Had a blast moving the blocks around and creating different designs. You can never go wrong with a log cabin. That is a quilting rule from my mom. My quilt, which I named Starry Night, is made primarily of foundation paper pieced blocks, except for the sashings and borders. Each block is made of 4 identical quadrants and the corner squares in the border are made of those quadrants also. I used 6 fabrics from the Twilight Chic line, and 1 fabric each from the Basics and the Blenders lines. The finished quilt measures 53″ x 53″. This is my first attempt to design a quilt. I think I’m hooked! Looks great. Isn’t fun to play? My design uses 3 of the Studio 180 Design tools plus a technique sheet. The tools are Tucker Trimmer I (or III), Corner Pop, and V Block. The Shaded Four Patch technique sheet is also needed. What a good idea to incorporate the use of different tools into the design. Something new to think about when designing. Thank you. Floating in Twilight uses the Island Batik Twilight Chic collection along with the Island Batik solid black for background. The pattern is based on a simple tumbling blocks layout. Using a dark background in place of some cubes makes it look like the cubes are floating. I was inspired to create this design by the rich colors of Twilight Chic. The light creams and golds glow next to the deep blues and purples. Paths all around the town to visit the park (center block), shops and restaurants (corner stars) and around again. It’s a perfect pattern for the Twilight Chic fabric. Beautiful design and color placement. I designed this quilt while on a cruise with my husband, the layout is based on a grid I saw in tile, I wanted something with various size blocks. The blocks themselves were designed to use Studio 180 Design’s Tucker Trimmer I (or Tucker Trimmer III) and the technique sheet for Shaded Nine Patch. The pattern is called Paradise Island and is available on my website The Quilt Rambler. I call my design At Summer’s End. The colors in Twilight Chic remind me of golden grains, purple mums, and green leaves turning to gold. I chose applique blocks to represent fall flowers and the busyness of harvest time. The simple chain blocks tie everything together. This quilt uses the Grandmother’s Puzzle block. It uses the Tucker Trimmer I, the Corner Beam tool and the Shaded 4 Patch Technique Sheet. Since Deb became a grandmother in the past year, I thought this quilt would honor her new title in life. I’m new to EQ8 and have enjoyed learning the many ways to use the software. The challenges push me to learn even more each month. I immediately thought of colorful birds of the islands and came up with this kaleidoscope pattern. Thanks so much for making learning fun! I love what you came up. This is one of my favorites for this challenge. I designed this with EQ8. I’ve had and upgraded from EQ2. Love it!!! Penny saved me many times. I like the fabric group and thought I would try it in a quilt. I designed the block myself. I made this using EQ8 and the Twilight Chic fabrics. It was designed with the Studio 180 Design Rapid Fire Lemoyne Star tool in mind. I am new to EQ7 and thought working on this challenge would be a good way to learn some of the ins and outs. There is the Four Patch Square Up, Square Squared, Tucker Trimmer 1 (or 3), V Block, Wing Clipper 1 and the Diamond Rects in the border. I saved several different coloring’s and would have made more if I had access to the Island Batik collections in the Manufacturer Basics section of the EQ7 Fabric Library (Basics, Blenders, and Neutrals). Or even a way to find out which ones they were so I could import them myself. I’m new to EQ8; and I’m going through the workbook. So I decided to use this beautiful batik collection in one of my “homework” assignments. I’m learning so much; this is such an amazing program. I love these Batik colors. I named my quilt the Drunken Bear. I love the Storm at Sea block and thought it would be interesting to try a Quick Quilt Project. What a great resource! There were five possible layouts just for this Storm at Sea Block. So many other choices with other blocks. I haven’t heard about the Studio 180 tools before but I think the wing clipper would be great to help with the flying geese units and the Large Square Squared would help to size each block up. I have previously made Storm at Sea using foundation piecing so this would be a different but interesting way to piece the blocks. I haven’t seen these tools at the quilts shows in Australia. Do we have them here or do we have to buy them online? I will have to look a bit harder next show (AQC in April). I made the NY Beauty block using Variable Blocks layout. The Tucker Trimmer Tool would be perfect to make the precise Flying Geese Border. I love the colors of Deb Tucker’s newest collection. I like this cloth very much. Using the pattern of Kaleidoscope, I design it with EQ 8. I think we can see the connection and the three-dimensional feeling of the loop. very beautiful. This is a brand new design of mine. It measures 58″ x 74″. It takes advantage of many wonderful tools by Studio 180 Design: VBlock, Square Squared, Tucker Trimmer I, and Four Patch Square Up tools. I can’t say enough good things about all of Deb’s tools – she made the tools so our piecing can look spot on! Thank you, Deb! I love this design ~ stunning with the dark background! I used Merry Kite and Flowering Snowball blocks for this quilt. This is Twilight Chic Ships Wheel. I designed this for a class and when I saw this challenge, I knew that I wanted to use it for this challenge. I resized the quilt to a wall-hanging size so that I can use the fabrics in the give-away. These colors are awesome! My first quilt design. I love these batiks. Such fabulous colors. This is my 2-block Purple Guacamole. Such a nice fabric collection to work with! I used a one-patch layout–Trapezoid. I drew 5″ rail fence blocks and filled strips with the Twilight Chic collection. I exported the image of each block and saved in image file with 11 different colorings. Next on Image Worktable, I imported the images one by one and chose “add as fabric” for each (different) colored block. On the Quilt worktable, Design, under Fabric Tools, I set the (new) striped fabric into the trapezoids. I used one fabric from Island Batik Basic to fill in the spaces between the striped trapezoids. I thought these fabrics would be good in a Kaleidoscope quilt. Designed completely around Studio 180 tools, the Tucker Trimmer for the 1/2 square triangles, the V-Block trimmer for those units, the corner pop in a couple of the units, in both the blocks and the sashing strips. This quilt uses a combination of the Corner Beam, V Block, Corner Pop, and Squared Square tools. Your design is fabulous! Gorgeous! I have owned EQ8 for a week and decided to learn more about the program by participating in this challenge. I’m also fairly new to quilting and a sun compass medallion quilt is on my bucket list. The Twilight Chic fabric collection has a very Aztec feel to them so that is why I chose this design. Fun project! Thank you! Very dramatic in presentation. Love it! Pagodas at Twilight – 51″ x 65″ – Features Deb Tucker’s Wing Clipper, Tucker Trimmer and Large Square Squared tool. Perfect, precise points made possible with these great tools! I love all of the purples in this collection. They are absolutely gorgeous. I named my quilt Shay Shay Chic. Love these fabrics. I also love Deb Tucker’s tools. I designed this with corner beam and bird of paradise units in mind. I think. I’ve never done this before. I just got my EQ8 program. this piece is so maticulously made..ITS GORGEOUS!! THANK YOU FOR SHARING THIS YOUR EXPERTISE WITH US!! I have only used the flying geese ruler before & my first thought after designing that I would need to paper piece some of the units for the blocks. After reviewing some of Deb’s videos, I see that there are several rulers/techniques that I would be able to utilize. Lemoynes Star, Wing Clipper, V Block, Tucker Trimmer & Corner Beam. The name of the quilt is Hugs & Kisses Among the Stars. I love batik fabrics so this was fun to design. The rich fabrics lent themselves to a black dahlia design. I love the color placement. Beautiful design. This used a Secondary Surprise block from the Contemporary Pieced collection of blocks. I would have liked more contrast in the Twilight Chic collection so that designs would show better. But batiks are lovely whatever their coloration. When I saw those beautiful rich colors I thought of Midnight Garden. I put it on point so the corner stones would connect with Block one (Five Spot). Block one called Five Spot uses the Square Squared tool and Block two called Sister’s Choice is using the Tucker Trimmer. A remake of my Mariners Madness quilt. Lots of foundation piecing! I love the mariners compass! Yours is amazing! Didn’t see a Bargello with these fabrics so I decided to give it a try! I used the more patterned prints as a bridge between lighter and darker. I like the movement. I think I will make this one! I love the movement in this quilt. Such great colors in this batik collection. I designed this quilt for using Studio 180 tools, the Tucker Trimmer and the Wing Clipper, for the half-square triangles and the flying geese units. It is a publshed pattern and I teach classes at my local quilt shop using it and introduce students to Deb’s tools. I would call this version Island Crossing. I love this color combinations and I am sure there are ten more quilts, but I love playing with the curves and straight lines – circles, lanterns…. I use batiks 95 percent of the time, I love their color saturation. I felt a little free form intuitive side explode with these yummy fabrics. I’ve never made a quilt using batiks but love these fabrics and would definitely want to make one now. I looked in the Block Library for something I’d never heard of before, and found a block called “Dunce Caps.” I played around with the colors, then used two alternating block colorations for the center of the quilt. I (finally!) figured out how to trace part of the block to make square blocks for the border. I rotated these blocks to create the border design. It was fun! This is way cool!! Beautiful job! As a newbie EQ8, I haven’t tried the tracing feature….You’ve inspire me to try! Evening In The Garden – This pattern is perfect for the Tucker Trimmer 1 and Wing Clipper 1. Each block uses a different fabric from the collection, with only two fabric repeats. This quilt was created using 5 of the Twilight Chic fabrics and 3 of the Studio 180 tools (the Rapid Fire Lemoyne Star Tool, the Tucker Trimmer III Tool and the Rapid Fire Hunter Star Tool). The Lemoyne Star tool was used to create the four large star blocks which were trimmed to exact size with the Tucker Trimmer. The Hunter Star tool was used to create the nine small star blocks. The colors were laid out so that the outer colors would match when sewn together and the blocks were turned on point to create the illusion that the pinwheels join together. I love the stars. You have inspired me to try working with diamonds. I have never designed a landscape on a quilt, I thought that this batiks and the colors were really appropriate. Love the colors and the prints. I just added a little bit of pink/red, I love to do cirlces. Block Fun came about using and having Fun with borders and thinking how I could use the Studio 180 tools. I fell in love with the DT16 Corner Pop so I played with more then one border and border lay out. When I placed the Coronation Frame block in the divided space the end made the quilt come together. The DT09 Square squared should be very helpful with all the cutting and making sure the pieces come together for the border. The Dt14 Large Square Squared would also help With Autumn Tints Around block and the Coronation Frame. The beautiful fabric have been fun to play with this month. The deep colors were hard to find the right lay out so they would shine. Along with the tools the batiks I will be look for them at the up coming hop in Ga. Thanks for the fun. This is a design I used to make a quilt for my Mom 2 years ago. Just different colors. I love the Batiks in this collection. I had to figure out how to use the Draw feature to create my 10 inch “Star block with pieced border on two sides” . then rotated every other block to get the scattered star effect. I love the 3D look to your quilt and you are right … this fabric is awesome. I make a quilt for each of my doctoral students when they graduate with their Ph.D. degree. This quilt was designed for Tia, who graduated last year with her Ph.D. in Literacy Education [I'm a little behind!]. The center block is a Wyoming Star; the medial blocks on each side are Wyoming Beauty blocks [she graduated from the University of Wyoming]. The four corner blocks represents states where she has lived or has gone to school: Colorado, Missouri, Nebraska, and where she currently teaches, Arizona. The fabric that appears grey in the blocks and border are fabrics with handwritting motif, as her research focuses on writing instruction. I used Deb Tucker’s tools for the flying geese, the square squared (in the Nebraska block), and to square up each block (and each sub-unit) as I make them. I love the “Sampler” look of this quilt. Would be great as a wall hanging. I always like the simplicity of Nine Patch Blocks. I am not a professional but with EQ8 I can put what I see in my head with out a lot of stress. I love this fabric line and use a strip set in a different layout of the Garden Pathway quilt I am working on as a thank you gift for a friend. I wanted to see if I could make another layout using only this fabric collection. I had not seen the contest until today and since I like the looks of this layout just as much as I did my first layout I thought I would see what all of you think. Even if I am not the top winner at least I might get some feed back that will make my designs better. I am looking at this layout as a beginner quilt and picture the four corners a floral displays and the center bow ties as the walkway through the display or garden. Have fun and keep quilting. Posies in Twilight used three additional batiks from the Neutrals and Blenders libraries. For me, a quilt isn’t complete without at least a little applique. Here I used posies to showcase jewel-like tones int he collection and two fabrics from Blenders for additional shading. When I make this little quilt, I’ll use Deb’s Wing Trimmer for the Flying Geese Border and the Flying Geese units in the center of the quilt. I love this tool and use it whenever there are two HST together I will use the Tucker Trimmer to square up my applique center. Sew much fun to design. I love the Twilight Chic fabrics, the colors are gorgeous.. I designed Twilight Stars with the Studio 180 Design tools in mind. I would use the Rapid Fire Lemoyne Star, the Diamond Rects and the Square Squared tool. Deb Tucker’s tools give the precision needed to make piecing this quilt stress free. Quilting should be fun and give you the results you hope for. This is a quilt I made for my mom over 11 years ago, with just a few changes. I’ve always wanted to make it again, but just haven’t gotten around to it. Back when I made hers, I didn’t have Deb Tucker’s rulers, but I do now! I would use the Corner Pop, Square Squared, V-Block and maybe Corner Beam (although I think the V-Block would work instead). I use 5 Twilight Chic fabrics. Love the batik fabric collection. I wanted to design a wall/door hanging for fall. I’ve only had EQ8 for three days but I am having so much fun learning the program. I am just getting into batik fabrics as I am also making some landscape quilts. For some reason I am taken with the Drunkard’s Path lately. This quilt is inspired by moonlight reflecting on the ocean. I love to make sampler quilts using the same block but different colors. The tool I would use is the Large Square Squared. I could use it to trim all the half-square triangles and flying geese. I used the Deb Tucker Corner Beam tool to construct the “windmill” blocks of this quilt. I like to leave ample room for quilting!